Recently, this story How Barbie Crushed Sindy appeared on the BBC website. Such a sensational headline, but it is true. The Sindy doll, created on the other side of the pond four years after Barbie (1959), always played second fiddle to her more glamourous American sista, Barbie. 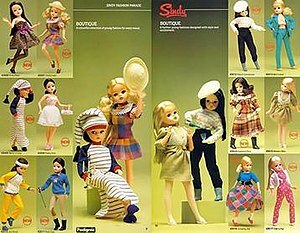 Sindy was a present on my ninth birthday, and she was the lady doll I always wanted. Every other girl had a Barbie, and while it is true that Sindy’s head was bigger, her eyes less blue than Barbie’s, she nonetheless had a lot of things going for her. The main difference was that Sindy had ‘real’ eyelashes you could stroke with a finger and doe-like eyes that looked sideways, paired with rosebud lips that didn’t show any teeth. Barbie, however, gazed hard at you like a peppy cheerleader with bright blue peepers and a white flashy smile. My Sindy had hair that could be brushed and styled, just like my own could be brushed and curled this way or that without losing its waves. It’s just a toy, but a doll which you’ve handled for hours, mostly by yourself, dressing her to go to wonderful places with cool, unseen friends, shouldn’t have been so quickly tossed aside. But adolescence beckoned and this favourite doll became quickly despised in the new light of music, poetry, fantasy books, girlfriends, clothes and fashion, parties and boys. It’s ironic how I wish for my Sindy doll now, not because I have a daughter who might have liked her as much as I did (she’s now 16 and her doll years were shortlived anyway) but because Sindy embodied my childish hours spent in idleness; it was she who opened up small worlds of simple chatter at picnics on the purple carpet of my bedroom, of always in the middle of going somewhere wonderful.